5 star review from Bill M.
If you're looking for an honest and dependable Anaheim auto repair shop, consider Import Auto Clinic. We are a family-owned business conveniently located at 3401 E. La Palma Ave, Anaheim, CA near restaurants and shopping centers. Established in 1980, we have been providing our friends and neighbors in Orange County with reliable and trustworthy auto repair and maintenance services for both Foreign and Domestic vehicles for over 30 years. We are a STAR Certified Smog Test and Repair Station and an AAA Approved Auto Repair Facility. We are also members of iATN and ASCCA. We have a team of experienced and ASE-Certified technicians who are well equipped in servicing all makes and models, specializing in Foreign and Domestic vehicles. From preventative maintenance and oil changes to engine repair, our technicians use only the latest tools and equipment to accurately inspect, diagnose, and fix your vehicle. While our technicians are working on your vehicle, you are more than welcome to spend some time in our clean and comfortable waiting area. There, we've prepared various amenities for you, including complimentary coffee, a refrigerator with great refreshments, free Wi-Fi, a TV, and very well maintained restrooms. If you have to be somewhere else and can't wait for your vehicle to be serviced, we offer complimentary local shuttle service. We also have five loaner cars available with only the cost of fuel as a service charge. Import Auto Clinic is committed to providing the highest possible level of customer service, honest care, and dependable auto repair and service for your vehicle in the greater Anaheim area and the North End community. 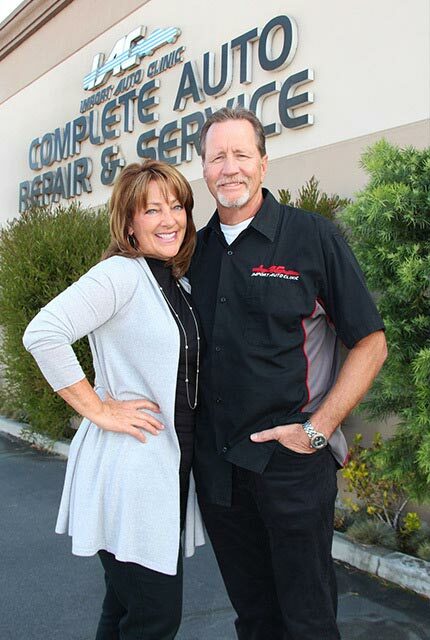 Visit our family-owned shop anytime, or give us a call to schedule your next appointment! Import Auto Clinic is a full service independent auto repair shop in Anaheim, CA! The Foreign and Domestic vehicle experts can address every need for your vehicle, from preventative maintenance, oil changes, and brake repair to extensive engine repair. Import Auto Clinic offers free test-drives for all of our customers. Our technicians will take the time to understand your vehicle and your needs so we can make the best recommendations for you based on its current condition. Above and beyond service and car care advice – it’s how you treat family.